A lot of people have trouble believing it, but Mitt Romney's 14.1% average effective tax rate last year ranked pretty high compared to many other Americans. But how does Romney stack up in the peer group he wants to join: American presidents? 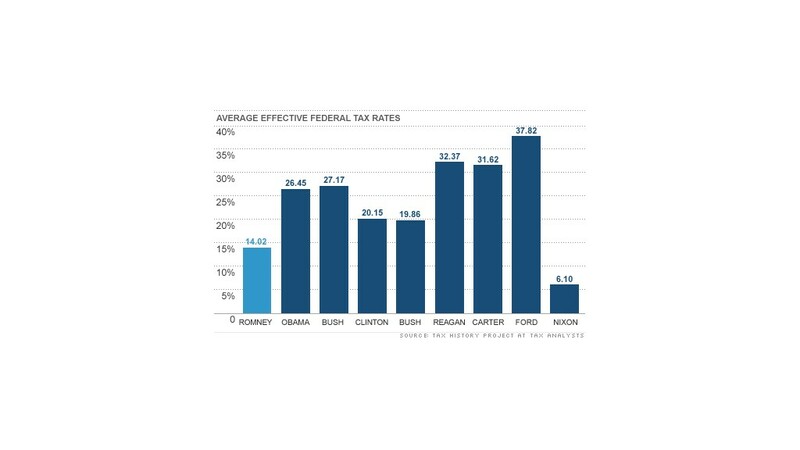 Compared to other presidents over the past 40 years, Romney's tax rate is quite low. It is the lowest, in fact, since Richard Nixon, who started the modern tradition of presidential tax disclosure when he got into hot water over those same low rates. There are many different ways to calculate average effective tax rates. 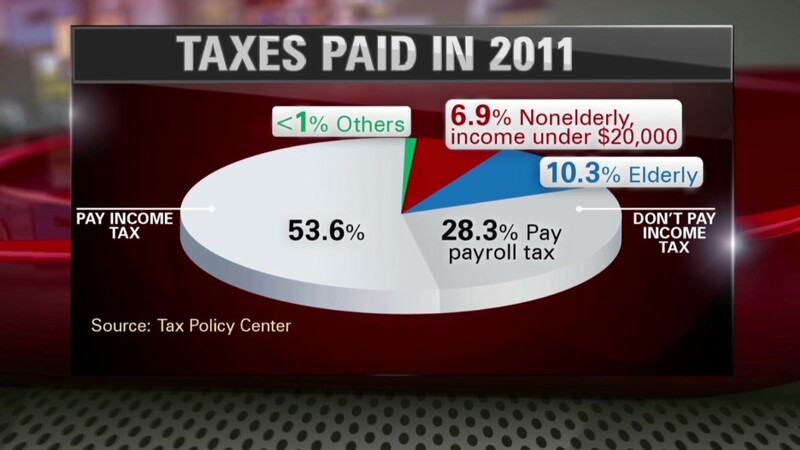 Romney's tax team, in last week's public announcement, used this one: total taxes divided by adjusted gross income. By that measure, Romney paid an average of 14.02% over 2010 and 2011. That's a lot lower than President Obama's average effective tax rate during his presidency of 26.45%. Romney's closest taxpaying peers would be Bill Clinton (20.15%) and George H.W. Bush (19.86%). Those rates are a lot higher than Romney's, but other presidents have been higher still. George W. Bush, whose signature tax cuts still dominate fiscal debate in Washington, paid 27.17%. Fellow tax cutter Ronald Reagan paid 32.37%. Why the rates vary: There are several reasons why average rates vary so dramatically among presidents. A big part of the story is tax reform and tax reduction. Over the decades, rates generally have been headed down, and presidents -- like many of their fellow Americans -- have benefited from that trend. In theory, tax reform has also eliminated tax preferences -- a trend that should theoretically push average rates up as it got harder to shelter income from the taxman. But for several presidents, the rate-raising effect of loophole elimination has been offset by the special low rate applied to capital gains (and some dividends). That's the camp Mitt Romney would be in. His rate is so low principally because he gets a big chunk of his income from capital gains -- something on the order of 65% to 75%. By contrast, most American presidents have relied much more heavily on various forms of "regular" income that don't get the rate preference accorded to capital gains. If he wins his race for the White House -- and continues to file tax returns that look like the ones released during the campaign -- President Romney will have only Richard Nixon to keep him company at the bottom of the rate roster. At the time, such donations and associated deductions were not uncommon. But Nixon managed to get a very high valuation placed on his papers. That gave him a nice large deduction, which he used to offset his income for several years. In 1970 and 1971, for instance, the deduction almost completely wiped out his tax liability. His tax rate in those years was just 0.3%. Eventually, word of Nixon's tax avoidance leaked out, and both Congress and the IRS investigated. In 1974, the president was forced to pay $465,000 in back taxes and interest, and some observers muttered darkly about the possibility of fraud charges. But the Watergate scandal soon took center stage, replacing tax avoidance as Nixon's most serious political problem. No one has accused Romney of anything like Nixon's aggressive tax avoidance. But Nixon's experience is still a cautionary tale. Right or wrong, Americans care a lot about the taxes paid by their presidents. And given the way we started down this path of presidential tax disclosure, Americans might be forgiven if they want to pry a little.